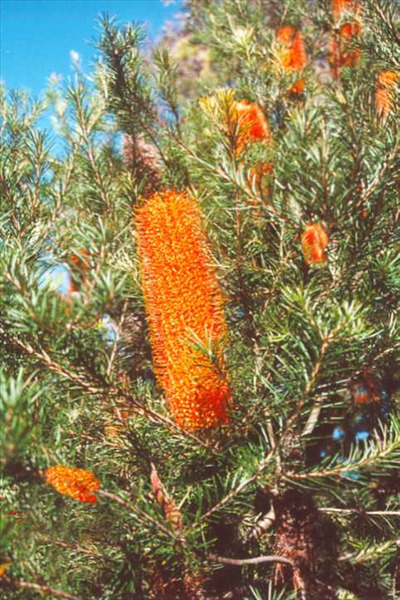 Ornamental large banksia with reddish orange flower heads in autumn-winter-spring. Suitable for well-drained light to heavy soils in partial shade to full sun. Grows well inland (Ojai) or coastal situations and is frost and drought tolerant. Excellent ornamental screen or hedge. Attracts birds to the garden. This B. ericifolia x B. spinulosa 'Giant Candles' is grown from seed so variable leaf & flower forms.